Antique Silver includes silver dating from Elizabeth I up until the mid-to-late Victorian period. The vast majority will date from George II, George III, William IV and George IV. You will find drinking vessels such as tankards and mugs, dishes such as porringers, entrée dishes, cake baskets and ice pails. 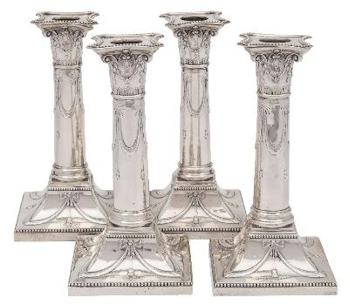 A Set of Four Victorian Silver Candlesticks, Maker Thomas Bradbury & Sons, London, 1899 (FS41/132), which realised £620. Wine, always a popular area, is catered for with wine funnels, claret jugs, wine ewers, coasters and quaiches. Desk furniture including inkwells, pen trays, candlesticks, wax jacks and tapersticks are also included. 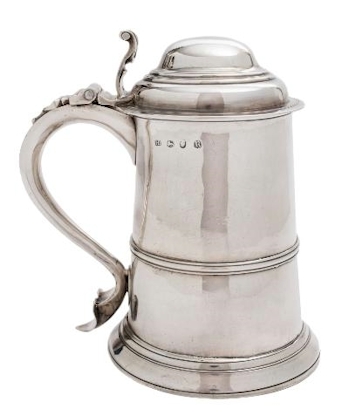 A George III Silver Tankard, Maker John Deacon, London, 1772 (FS39/121), which sold in one of our Fine Art Auctions for £1,050. Also in the catering line, condiments and other tablewares are included with cruet stands, mustard pots, salts, pepperettes and butter dishes well represented. In this category too, you will find the top silversmiths including the Batemans, Matthew Boulton, Robert Garrard, Robert Hennell I, II and III, William Eley and William Fern to name but a very few.